Your bird field guide may be out of date now that University of Florida scientists discovered a new genus of frogmouth bird on a South Pacific island. New genera of living birds are rare discoveries — fewer than one per year is announced globally. David Steadman and Andrew Kratter, ornithologists at the Florida Museum of Natural History, turned up the surprising new discovery on a collecting expedition in the Solomon Islands. Theirs is the first frogmouth from these islands to be caught by scientists in more than 100 years. They immediately recognized it was something different. Kratter and Steadman are co-authors to a study analyzing the frogmouth’s morphology, or physical form, and DNA in comparison to two other living genera of frogmouths. The findings are published in the April print edition of Ibis: The International Journal of Avian Science, in a paper that describes the bird as a new genus and species, now named Rigidipenna inexpectata. Originally, the bird was misclassified as a subspecies of the Australian Marbled Frogmouth, Podargus ocellatus. The blunder went undetected for decades, until a collecting trip led by Kratter in 1998 turned up a specimen on Isabel, a 1,500-square-mile island in the Solomons. Today, the only museum specimen of this bird in the world, with an associated skin and skeleton, is housed at the Florida Museum. Frogmouths are predatory birds named for their strikingly wide, strong beak that resembles a frog’s mouth; but their beak also sports a small, sharp hook more like an owl’s. Steadman said their beaks are like no other bird’s in the world. They eat insects, rodents, small birds — and yes, even frogs. For perspective on the scale of evolutionary difference between genera, consider that modern humans and Neanderthals are different species within the same genus (Homo), while chimpanzees are our living relatives from a closely related genus (Pan), but that we share the same taxonomic family (Hominidae) with our chimp cousins. The Solomon Islands Frogmouth differs from other frogmouths in a number of significant ways. First, it is probably not as accomplished of a flier because its eight tail-feathers, instead of the typical 10 to 12 on other frogmouths, curtail its lift potential, and its much coarser feathers reduce maneuverability. “These are island adaptations that work to keep the bird on the island,” Steadman said. Second, it has distinct barring on the primary wing feathers and tail feathers, where other frogmouths are more uniform. Its speckles are larger, and the white spots on its breast and underbelly are more pronounced than on other frogmouths. Two other genera of frogmouths exist: one in southeast Asia and the other in Australia and New Guinea. The Solomon Islands Frogmouth is known to inhabit three islands: Isabel, Bougainville and Guadalcanal. 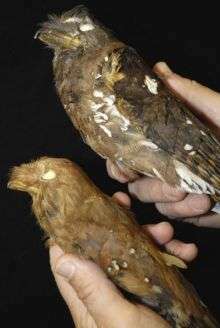 Van Remsen, curator of birds at the Louisiana State University Museum of Natural Science, said that this new frogmouth genus serves as a poignant reminder that birds of the tropics, particularly from southeast Asia to Melanesia, have been paid scant attention by science. Storrs Olson, a senior zoologist with the Smithsonian Institution, said that frogmouths are an enigmatic group of birds to begin with. “That this should prove to be such a distinctive new genus, which it unquestionably is, has profound biogeographical implications and represents a real breakthrough in elucidating the evolutionary history of the family,” Olson said. Nigel Cleere of the The Natural History Museum in the United Kingdom is the lead author for the paper and additional co-authors include: Michael Braun and Christopher Huddleston of the Smithsonian Institution, Christopher Filardi of the University of Washington’s Burke Museum and Guy Dutson.